Welders are in the business of making and fixing things. Without them, so many things we take for granted—cars, ships, and even sculptures—couldn’t exist. So what’s it like being a welder? Welders do not need a college degree; most gain a certificate from a technical school or work as apprentices. Welders use a blowtorch to melt metal and forge it into something new. They wear protective clothing, including a welding helmet to protect their eyes and head. 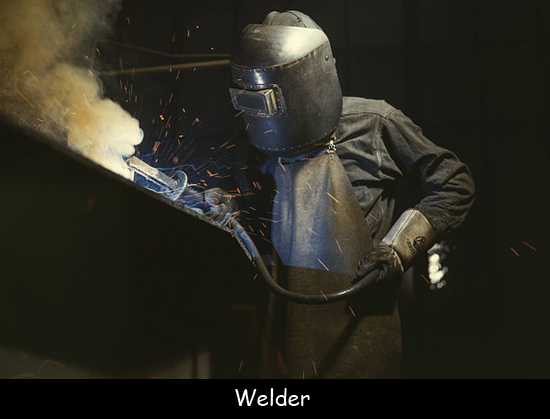 The sparks that fly from a welder’s blowtorch are actually small pieces of molten metal. Ouch! Welders do have a higher than average rate of injury. It’s important to choose an employer who takes safety seriously. Welders can work in a lot of different places—on skyscrapers, on pipelines, or even under the ocean. Welders often travel all over the world. Some even live on the road, traveling from place to place for jobs. Welders’ salaries vary a lot. Inexperienced welders might earn as little as $20,000 a year. Highly skilled, motivated welders can earn $100,000 or more—not bad for a job that doesn’t require a college degree. Welders are needed in all kinds of industries—from construction to automotive—to education. If there’s something to be built or fixed, welders are probably there. The profession of welding isn’t going anywhere. The need for welders will probably increase in the future. Question: How do I learn more about welding? Answer: Many high schools now have programs that teach skills like welding. Watch a short video about a girl who wants to be a welder when she grows up. Declan, Tobin. " Welder Facts for Kids ." Easy Science for Kids, Apr 2019. Web. 25 Apr 2019. < https://easyscienceforkids.com/welder/ >.